The choice of a really comfortable and durable in use mastiff dog harness is easy with Fordogtrainers. We care of comfort and durability for your large pets. Our designers made probably the best dog harness model for mastiff breeds. 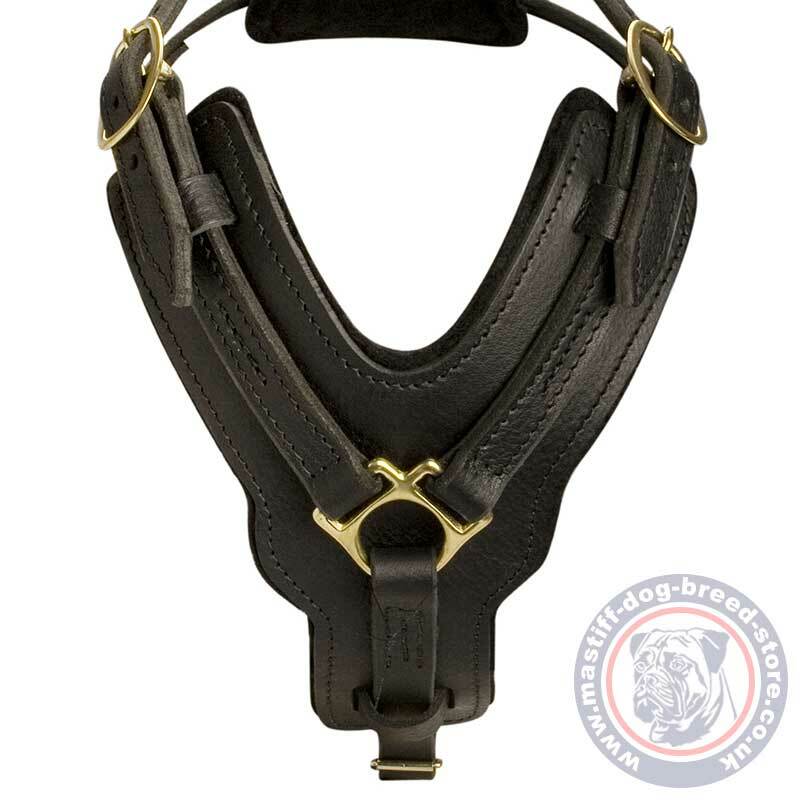 Large dog harness choice should be based on the quality of the materials in the first turn. We use natural leather of top quality. It is thick, flexible, soft and durable even for a large and powerful mastiff. That's why we recommend this large dog harness as a great tool to manage mastiff temperament and use it for control of your dog in walking and K9, agitation, attack and obedience training. Perfect form of the best dog harness design for mastiff dog breeds has Y-shaped chest leather plate. It is soft padded with felt. The best dog harness for your mastiffs is reliably stitched, handmade by professionals. 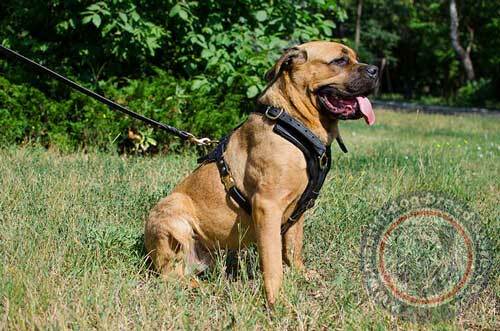 Mastiff dog breeds are the largest and the strongest canine representatives. You need a really quality gear to handle this beast. Though mastiff temperament is calm and friendly and sometimes a dog is even unaware of its power, fortunately :). 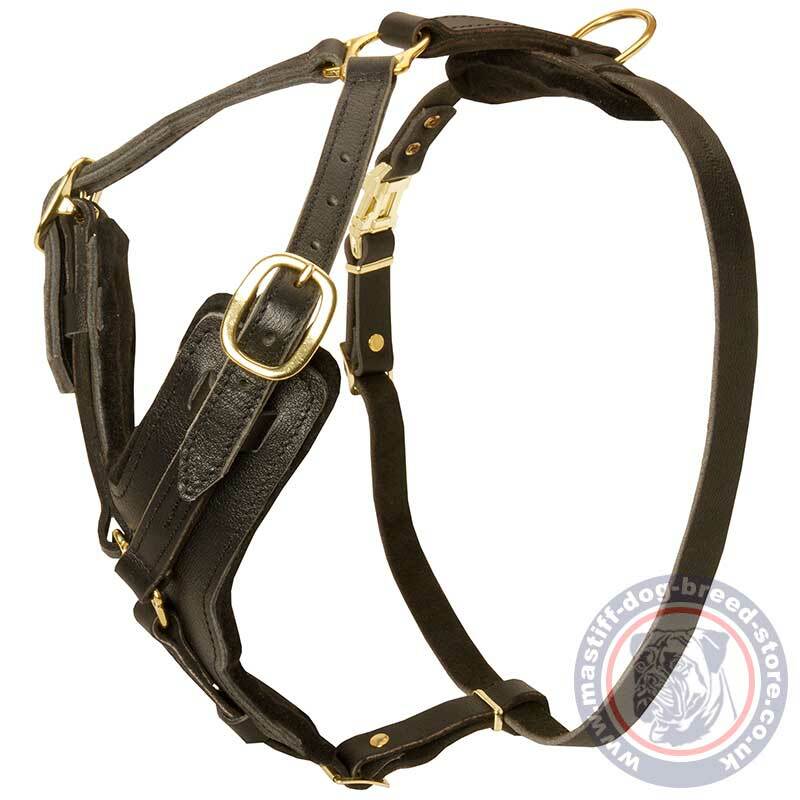 This large dog harness is intended especially for the needs of a mastiff owner. Our best dog harness is super strong and comfortable! Dog trainers and owners use it for dog training in attack, agitation and for reliable control over a strong dog in daily walking. 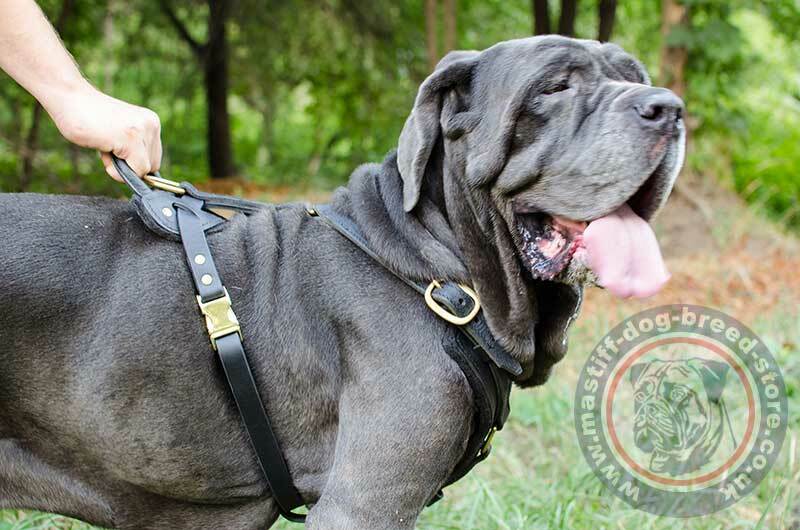 Elegant design of this large dog harness will make your mastiff look gorgeous! 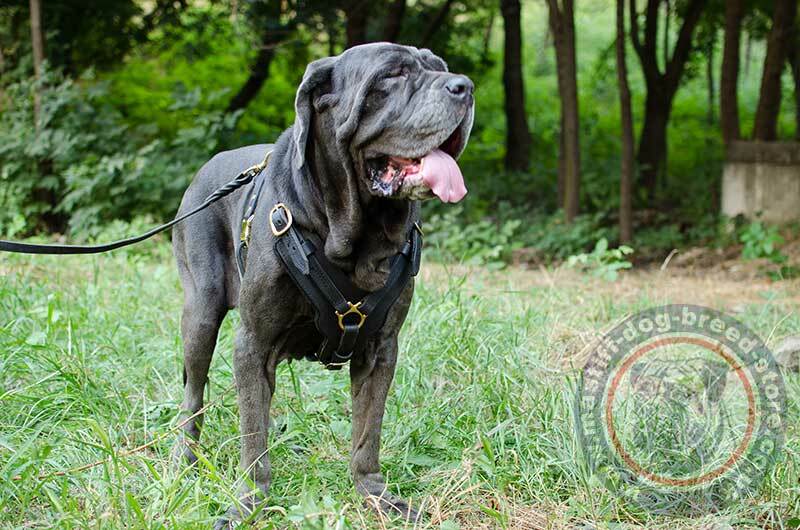 Perfect Large Dog Harness for Cane Corso Mastiff! 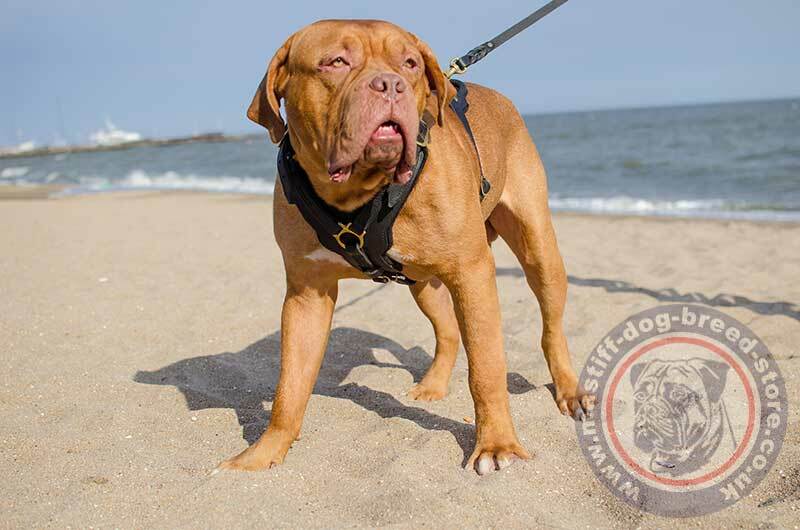 Make Your Dogue De Bordeaux Feel Super in the Padded Leather Large Dog Harness! Everything is fine and I am completely satisfied with the harness. I am sure that I've made the right choice and my dog loves your harness very much. I am 100% happy with the harness. Once again, a big thank you for your efforts, all is perfect. Hello, dear Helen. Sincerely grateful from all my heart ♥ for the cool harness, your wonderful service! Super-quality! Warm regards from Luebeck.